Customer Purchases allows you to buy devices from Customers, and then track the Item's status if any refurbishing is needed before adding it to your Inventory as a ready-to-sell Item. These Receipts are meant to store the details of what you bought, plus the identification of the person you bought it from - and give you an easy receipt to hand them. From there, you can create a new Purchase, or Modify existing ones. To create a new Purchase, you'll need to begin by finding or creating a new Customer. 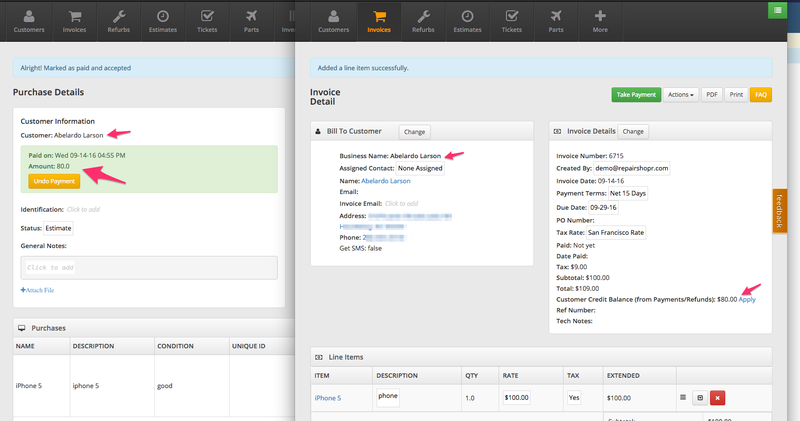 After adding the Item(s) to the Customer Purchase, you'll have the ability to add Notes in the Comments/Notes field, and see your notes history in the Log to the right. Notes are intended to be used along with the Status drop down, for tracking the progress of the device before it is added back to your Inventory. * If you have a Payment Method of type 'Store Credit', you can record the purchase as a credit to that Customer for later use on Invoices.